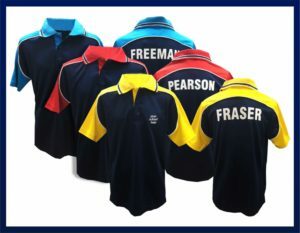 Can’t decide which sports house polo is the best option for your school? Our team understand you need to consider many factors such as climate, comfort, durability and of course, cost. We have you covered with numerous options that your kids look fantastic in and stand out! Take a look at our options below and call us on 07 4053 7355 for more help on which option best suits your school. A plain polo in your choice of house sport colours. Embellish the front with screen printing and/or embroidery. A great option for the house name (and mascot if you have one) is screen printing on the back. This is the most simple and economical approach to your house polos. Prices vary depending on quantity. Call 07 4053 7355 for enquiries. Upgrade to an effective looking cut and make polo. 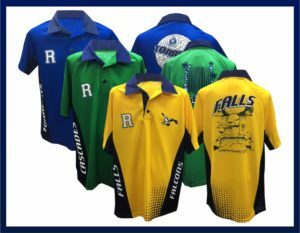 The base of your polo can be in your main school colour, with contrast panels representing the house sport teams. Enhance the look with screen printing on the back and/or embroidery for your logo on the front. For an added extra ‘wow’ factor, the panels can be sublimated to give it the ultimate unique look! Take a look at our cut and make range and call for enquiries on 07 4053 7355. Prices vary dependant on quantity. The ultimate in design freedom! Try our sublimation option to allow any design, any colour on any or all of the pieces of your garment! Collars, under hems, backs, front, sleeves, tabs….all pieces printed in any fashion you like! 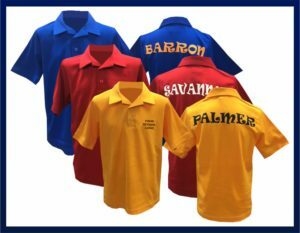 Print mascots, logos, motifs and house names anywhere on your polo! This allows for great effects, producing an incredible sports polo the whole school will be proud of! Prices vary dependant on quantity. Call for enquiries on 07 4053 7355. 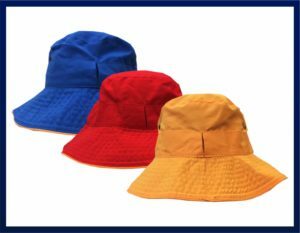 Complement any of the above polo options with a sun safe bucket hat in a wide range of colours. These can be plain or reversible with a toggle. They can be embroidered or screen printed to match your polo! Prices vary dependant on quantity. Call 07 4053 7355 for enquiries.